Blogging is a fantastic marketing strategy for both online marketers who is trying to grow their readership as well as small business establishments that want to define their brand to the public. But it’s not something that you just publish and assume that the traffic will come pouring in. Today, I am going to go through the 5 common mistakes bloggers make and how you can take corrective measures to improve the overall quality of your writing. It’s very tempting to start a blog with free platforms; they are everywhere, they are easy to use, and doesn’t cost you a single dime. Yet the consequences that you have to deal with is the level of quality that comes with such services. For example, be prepared to face slow page loading, appalling web designs and more often than not, poor rankings on the search engines, if they even rank at all. It may be okay if your blog is merely used for personal activities, but if the purpose is to market a product/services and to acquire new leads or clients, then creating a free blog is really not a good idea. Use self-hosted WordPress because for every dollar invested in good quality web hosting, you’ll get a more secure site that’s not prone to hacking, faster page speed, better branding, solid backup for your content and most importantly, generate more traffic. This is because a lot of themes are now mobile responsive and there are unique WordPress plugins that can tweak many settings, rendering a website more search-engine and user friendly. The more Google can discover your blog through these features, the better you would rank on the first page. If you haven’t used WordPress before, here’s an opportunity to create on for free and take it for a test drive. Many people tend to write a blog using their own tone and as a result, they ended up sharing their personal stories instead. This is not entirely wrong and you are most welcome to write the details in your ‘About Me’ page. But if you are going to do it in every other post, it’s going to serve very little values to the readers because it’s not a very professional approach from a business point of view. Since most people go online to search for solutions to THEIR problems, sharing personal stories over and over again will not help in such situations. Even as you think you’re being informative, sometimes the message may not come across as that and readers will be left confused, wondering what you are trying to say. Find the readers purchase intent within your niche and stick with it. If someone wants to keep track of their calorie burning, providing a fitness tracker product review can be a good solution to their problems. If someone wants to buy a comfortable shoe for the summer, recommending a list of affordable footwear from a reputable online retailer would help. Every niche has its own set of general keywords and within that, a much narrowed down keywords that should make human sense AND guide you towards a targeted audience that is a potential customer. When you select keywords with deciding or buying intent, you are this much closer to getting people to convert in your niche versus keywords that are merely informative and general. As you come to understand the customer purchase cycle within your niche, your blog can then be written properly for the readers (and not for you) and the content structure will thus be more focused and relevant. For those who haven’t dived deep into keyword research yet, use this free tool below to find out the keywords popularity and competitiveness within a niche before using them on your content. Long before a blog is deemed as popular, it must first be informative in a textual sense. This quality should be apparent in the first two paragraphs or rather, the upper fold of a webpage. Online competition in any type of niche is inevitable, but one aspect that can clearly distinguish you among the rest is the amount of knowledge that you invest into a content. Content with substance, in a way, is engaging to read and because they make human sense, Google is more likely to discover, index and rank them for a variety of keywords. Often times, the longer the post, the better. But if you outsource the task to poor quality freelancers, chances are you are not going to leave a strong impression to the readers. So here are some effective ways that can be implemented to improve the quality of your blog. Research a topic from every angle and study from resources like Google News, videos, market statistics and other blogs to draw important key points. Elaborate based on those key points as much as you can and if you let the process sink in, you’ll end up with an original lengthy article, which is a good thing. Include internal and external links to guide readers to relevant content from your previous posts or to articles from other reputable sites. This can also help Google to understand what your website is all about and rank them better on the search engine. Avoid using any content creation shortcuts like PLR articles or article spinning software because they will have detrimental consequences on the longevity of your blog. Likewise, copying other people’s content and re-publishing it as your own is a big no-no too. Yes, all of these take an enormous amount of time, but the cumulative effect from constant practice will show readers that you are genuine, knowledgeable and even exude some degree of authority within your niche. Now, wouldn’t that be a nice milestone to achieve? Engagement here basically means getting the readers to involve themselves in the context of the article, either through reading or contributing their opinions on the subject matter. Remember the last time you couldn’t put down a book that you were reading? That’s engagement. And what about the time you kept replaying a video? That’s engagement too. In this digital age, content that fails to capture one’s attention is generally considered boring and thus, losses out in online traffic. 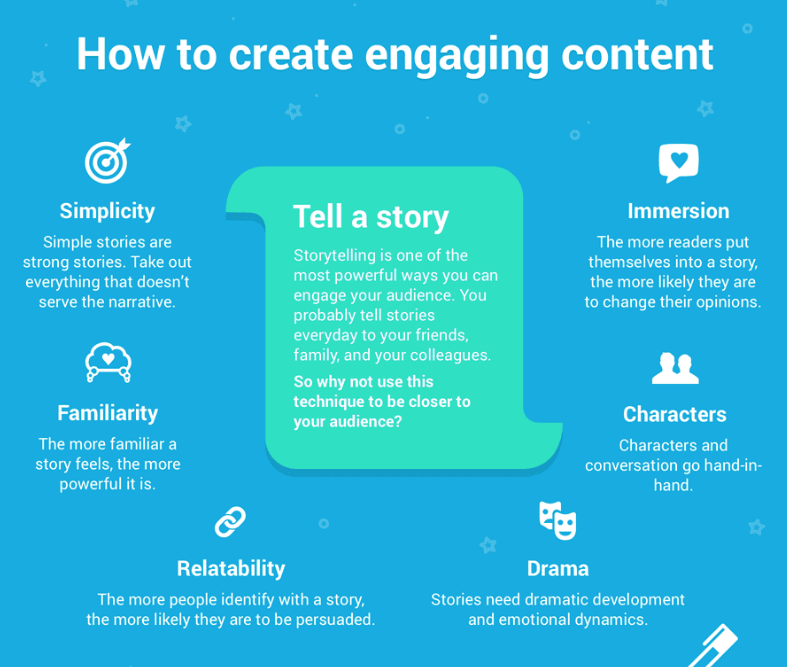 The fix to this is to write more engaging content and there are THREE areas on which you can improve upon, without having to be an expert. 1 – Improve readability – In plain English, this simply means the ease of reading. So write as if you are talking to someone without trying to sound impressive. Apply words that you frequently use and commonly understood by most people. The second thing is to break the content into smaller paragraphs (hint; see what I am doing with this article?) and use key points whenever necessary. Go for the standard black font style like Arial or Verdana and font size between size 11 and 12 for comfortable reading experience. While doing this, make sure to also keep a good balance of white space in the background so that the content can still be read without driving your readers crazy. 2 – Improve visuality – Graphic media can complement our content in a good way when used appropriately. They enhance keypoints and attract readers. Thanks to the massive online resources, graphics can be easily obtained for free without having you to create them. For photo images, search under Photopin or Pixabay. If you want to get creative, there’s always the freemium Canva designing tool at your disposal. For videos, you may use any media that is embeddable, meaning that the creators allow public users to share their videos on other platforms. In most cases, there shouldn’t be any copyright issues, but if you are concerned, then just shoot an email to the owner and ask if it’s okay to use. For other creative media, you can also embed an e-magazine or add a SlideShare presentation to boost the engagement. Whatever the choice, keep it moderate, professional and relevant to the content. You don’t want to end up overwhelming the readers with too much visual elements either. 3 – Get Comments – Many don’t realize this, but getting comments for your blog is one of the most solid form of social engagement. It allows readers to ask questions, share experiences and express different opinions. In return, what is gained is a better understanding of your audience’s mindset and the opportunity to create more relevant content. The other good news is, comments also add to the overall density of a content. An article that is a thousand words long can be boosted to two thousand words due to a stream of engaging comments. And in the eyes of Google, that blog post is worth checking out and subsequently rank for. As a beginner, getting comments the natural way can be difficult because no one really knows who you are. So the best way to get started is to ask for comments through your favorite social network or niche related forums. Even so, that can be a very slow process. Personally, I use a site commenting system created by a robust blogging community where we exchange comment favors for each other’s site. I’d offer my comment on a certain topic and someone else do the same for mine. Some are quite general, but the majority of the comments are usually interesting and constructive. At this point of writing, I just received 40 comments for several articles over the past 24 hours. That’s how fast and responsive the community responds to request so it’s very exciting to use this platform and get a good boost of traffic to my newly published post on a daily basis. It’s easy to get fired up with blogging at the beginning with all those exciting ideas, but such enthusiasm tends to fizzle out several months later and this is most noticeable when you don’t publish as often as you used to. Maybe you got caught up with the daily grind or perhaps, the niche is no longer interesting for you. Regardless, this will have a negative impact on your site. With less content, you wouldn’t be able to put up with new competitions, there are lesser keywords to rank for and it’s impossible to create engagement without new information. All of these can literally cause a site to become non-existent or in other words, dead. So, if you don’t want to head towards that direction, try these methods. Create a keyword list that can last several months so that you can grab any topics and start writing without having to research every single time. Select the days that you MUST publish a new post and STICK with it. Create a few posts ahead of time so that you don’t have to work under pressure to meet the publishing date. This will give you more room to focus on improving the quality of your content. Consistency is key to steady traffic generation so find what works for you yet, don’t stretch yourself too thin trying to do something beyond your capacity. All successful bloggers, at one time, had their fair share of making these 5 common mistakes. So it’s nothing to be embarrassed about. In fact, it’s a good thing to experience and rectify now than later. The sooner you learned what’s right versus wrong, the faster you could crack the code to turn blogging into a profitable online business. Besides the ones that I’ve mentioned, what type of mistakes have you encountered so far? Please share with us in the comment below. These five common mistakes are important to take note of as they will result in negative consequences. From my personal experience, I do not trust any other platform besides Wealthy Affiliate. Using Jaaxy to come up with topic keywords for content is a good approach that has worked well for me. I also seek to get engagement on my posts by commenting on other people’s posts. I noticed that if I do this consistently, the overall traffic to my blog improves too. I love your post and have bookmarked it. It’s very informative and straight to the point. And I love the five points that direct a person to creating the perfect blog. As a new blogger, the points are very important and relevant to my current situation. I too believe it is best to write straight from the heart with material that will help others out and not getting wrapped up in making it a personal story about yourself. After reading your post, I know right away that I have to work on my engagement and publishing consistency. It is so hard where I feel that I have so many obstacles in my daily life (I know we all have it) and come back to work on my blog. What do you do to have the right mindset? I tried so hard to focus and be disciplined, but like always, I am my worst enemy. How do you stay motivated? Great read by the way – will work on the areas that you suggested. Hi Nuttanee, for starters, I don’t try to accomplish too many (blogging) tasks in one day. I usually spread them throughout the day, even while I am on my day job. For example, I brainstorm for keywords in the morning, write down some points and then come back home to finish up with the writing process. It takes a bit of practice and if you have a strong will power – mine is to achieve time freedom – that should keep you motivated for a while. I have just started blogging and didn’t even realize that I am already making some of these mistakes that you mentioned. Thank you for posting this. It helps me to be aware of what I should avoid in the future and how I can improve on my blogging skills. You are totally right. Building a blog takes some investment and you can’t just rely on doing everything for free. I’ve learned that spending money on hosting and keyword tool like Jaaxy is really worth it. I mean, if you are doing content marketing, it’s important to have a good targeted keyword in hand. Why would you want to compromise that, right? I totally echo what you say. Get a good WordPress hosting platform, use keyword tools that can show you SEO competition metrics and always research before writing your content. These are the foundation to steady and recurring traffic for any type of blog that you want to make money with.